Wounded bus driver, Ignatius Jn Baptiste, is happy to be alive after bandits this week shot him and robbed him. Jn Baptiste told St Lucia Times that he was heading towards his home in New Village Wednesday evening after work when three masked men approached, firing shots. The bus driver said he was hit three times in the leg. The 54 year old New Village resident recalled that when he fell to the ground, he felt a foot at his throat. “Two of them rushed me and started searching me, then they ran away,” Jn Baptiste said. He said he could not make out who his assailants were because they were wearing masks. “They were not even talking. They didn’t even tell me ‘Hello! Hi’ or “Pass it!’ – they just started firing shots towards me,” Jn Baptiste recounted. The wounded bus driver told St Lucia Times in addition to $900 in cash, the criminals relieved him of his ID card and driver’s license. 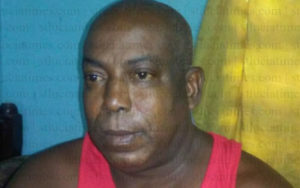 Jn Baptiste, who has been discharged from hospital, said it was the second time he had been robbed in the same community. He expressed the view that just one set of criminals are responsible. According to the bus driver, there is a lull in criminal activity in the area when the police arrest them and they are incarcerated. But he lamented that once the criminals are back on the streets, they continue with their unlawful activities. “It’s only one set and they wear masks so you can’t tell,” Jn Baptiste stated. He expressed the view that the neighbourhood is safe, but once the criminals are out they create problems for the community. Jn Baptiste said he did not expect to be ambushed about 7.00 p.m.
“I always know those fellows out after midnight. Around 7 O’ clock I never thought they would be out,” he stated. The victim disclosed that two of the bullets passed through his leg while another had to be taken out at hospital. “I am wounded, so I can’t go to work. That means I am losing,” he said. But he said he will be able to cope. Jn Baptiste said he knows that the police cannot be everywhere at the same time and made it clear he would not say anything against the law enforcers. But he did assert that when someone summons the police, the cops should always take it seriously and respond. He also had a message for the criminals who shot and robbed him. “You all want to take my life – for what? Three hundred dollars between three of you all? I had $900, so that would be $300 each for the three of them. Come on man garcon, get something else to do,” Jn Baptiste stated. Then he asked rhetorically what would have happened if he had no money when the bandits ambushed him. We need Batman in this country. Time to fight evil with evil .. Them criminals getting outta hand..
Well my brother, i wish you a speedy recovery from your wounds. May the good Lord continue raining his Blessings on you! What do you think we should do, to take back our country from these little fools? Do you think that we are breeding criminals? What do you think about ORC. and the hang man? Do we need a referendum for that? Watch, you nearly lost your life for crumbs. Where were your rights Sir? Ask miss Mary!